The 9 o’clock news comes on, and one of the first stories in the headlines on a daily basis for weeks on end has been the bloodshed in Syria. Every day a news anchor wearing the perfect shade of red lipstick reads out the rising death toll. The latest estimates put the total number at 7,500. We watch, we switch off our TVs and we go on our way. Some of us may post an update to Twitter or Facebook, expressing our horror at the daily loss of life. We share articles, exchange our thoughts on what should be done, and lament the fact that a massacre has been taking place in Syria for weeks. But how many of us really think about what those numbers mean. How many of us stop to consider the fact that one of those 7,500 people who died include someone’s father or a toddler that just took its first steps? Probably not too many of us. That’s why Syria: Faces of the Fallen is a small but incredibly important project that is taking on the overwhelming task of reminding people what exactly is happening in the country. The site, a project in social journalism, is crowdsourcing photos from Syria, attempting to document information on the thousands of men, women and children who have lost their lives in a relentless bombardment, with no end in sight. 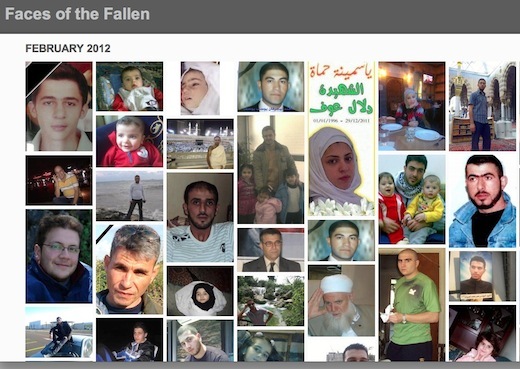 So far, Faces of the Fallen features 122 posts, uploaded in February alone. In the case of Egypt, we’ve seen a few online examples emerge that aim to do the same thing. 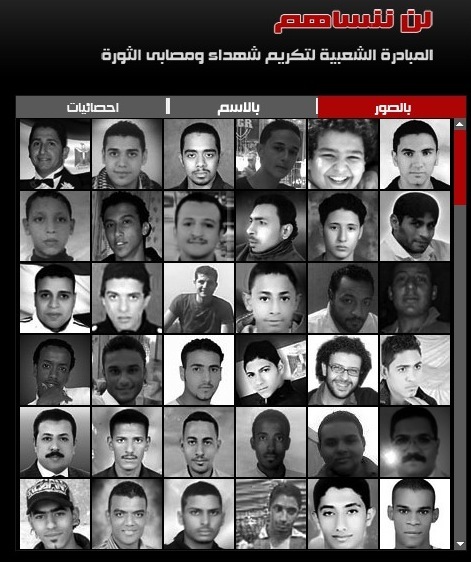 Lan Nansohom (which literally means, “We will not forget them”) is a site featuring images of Egyptian men and women who have lost their lives in the ongoing conflict in Egypt. The site begins with the very first day of the uprising, January 25, 2011, coming full circle to the most recent clashes that left hundreds of Egyptian football fans dead at the end of January this year. It features the names and photos of hundreds of men and women, some under the age of 15. 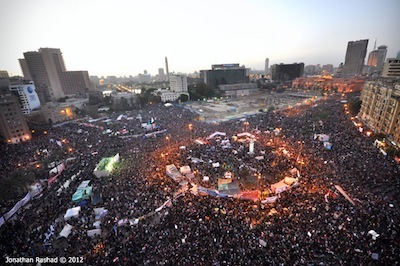 An entire platform, 18DaysinEgypt, was established to document and record the events of the Egyptian uprising, through videos, pictures, tweets and more. The platform, which we took an in-depth look at here, takes viewers into the heart of the conflict. Last January, we became accustomed to the mandatory aerial view of Tahrir Square, the epicentre of the protests in Cairo, showing nothing more than a sea of unidentifiable heads. Instead, 18DaysinCairo brings us on-the-ground footage reminding us that literally, in the midst of the protests, people were getting married, making music, and creating art. Internet-based crowdsourcing has proved to be a popular tool in the Middle East. Whether used to shed light on sexual harassment or crowdsource transparency in elections, it has also become a tool to remind Internet users the world over of how the conflict has affected the people caught in the middle of it. We are constantly reminded of the shortcomings of citizen journalism and social media, crowdsourcing, and other tools that have pushed themselves to the forefront of journalism and media today. But sites like Faces of the Fallen and Lan Nansahom are an essential reminder that there are some places mainstream media can’t go, and some things that journalism simply can’t give us. While social media has played an integral role in getting the story out, whether in Syria, Bahrain, Egypt and beyond, with continued violations of human rights, as a platform, it also becomes increasingly easy to detach ourselves from what is really going on. Technology doesn’t always lend itself to the most ‘human’ of experiences. After all, it’s all just a series of 1s and 0s at the end of the day. But projects like Faces of the Fallen and Lan Nansahom are a much-needed reminder that there’s so much more at stake than that, and use that very tool, that binary and algorithmic world, to create a human connection.